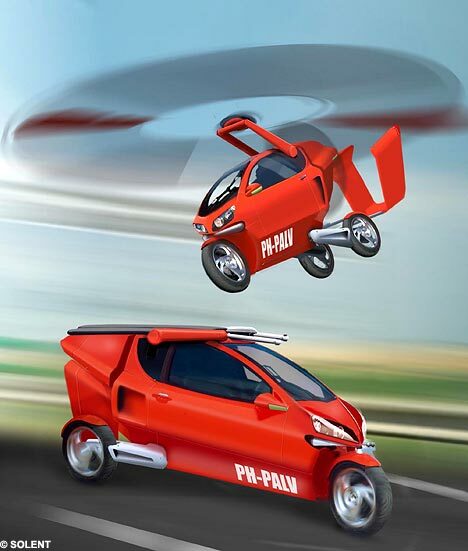 Is PAL-V the world's first practical flying car? The Personal Air and Land Vehicle is a three-wheeled vehicle that will allow you to attain speeds of up to 125 mph on land, and then soar to heights of up to 4,000 feet. When on land, it corners like a motorbike, but once its foldable rotor, propeller and tail section are extended, it becomes a gyrocopter. The rotor provides lift, and the propeller at the rear provides forward thrust. Steer it like a car and it banks like a motorcycle. It sounds deceivingly simple. And it truly is. At the heart of the PAL-V lies the Dynamic Vehicle Control (DVC™) system which automatically adjusts the tilt angle of the cockpit to the speed and acceleration of the vehicle enabling a plane-like 'tilting before cornering'. The driver's input or steering torque is distributed between the front wheel steering angle and the cockpit tilting angle. This distribution is automatically adjusted to varying speeds and road conditions to ensure an optimal balance at all times. At lower speeds the steering torque is directed to the front wheel angle and the passenger compartment remains upright. At higher speeds the steering torque is mainly directed to the tilt angle of the cockpit and rear wheel steering. Once manufactured, the PAL-V will cost you about the same as an "executive saloon car" - about $75,000. You'll need a Special Light Sport Aircraft certification, a Sports Aviation License, motorcycle license, and standard automobile driver's license for operation of the vehicle in the U.S.
Science fiction writers have been dreaming about flying cars for a long time; the earliest use of the word aerocar was in 1900. I can't remember the reference, but I've seen illustrations of French science fiction from the late 19th century with illustrations of what are obviously flying cars. For a somewhat more modern version, see this article comparing the X-Hawk Fancraft with the Blade Runner flying car (see also a related X-Hawk Fancraft concept video). Via Lovely Jubbly - experts design the world's first practical flying car; thanks to reader Jez Rouse for getting the New Year off to a great start with the story tip. Also, take a look at the PAL_V website.